Keeping up with the tradition of visiting National Parks on the 4th of July long weekend (It was Rocky Mountain National Park in 2011 and Yellowstone National Park in 2012), we made plans to visit the Yosemite National Park this year. Yay!! For all those planning to visit Yosemite, please make your bookings much much in advance, especially if you are planning to go in summer. As for us, it took me several evenings and weekends to find a nice place inside or very close to the park, though I started looking for a cabin/camping site 3 months in advance. There are several options outside the Park but what's the fun in staying in a town? Luckily, after a long search, I ended up booking a cabin at an awesome location, less than a mile from the Park's East Entrance. Amidst mountains and meadows, granite rocks and tall trees, lakes and creeks, there is this beautiful resort with 10 cabins and 4 rooms called 'Tioga Pass Resort.' The only reason I believe it was not booked is because they are open for only a few months in the year and do not have access to telephone nor do they take deposits. You can only reserve through email and pay once you reach there. 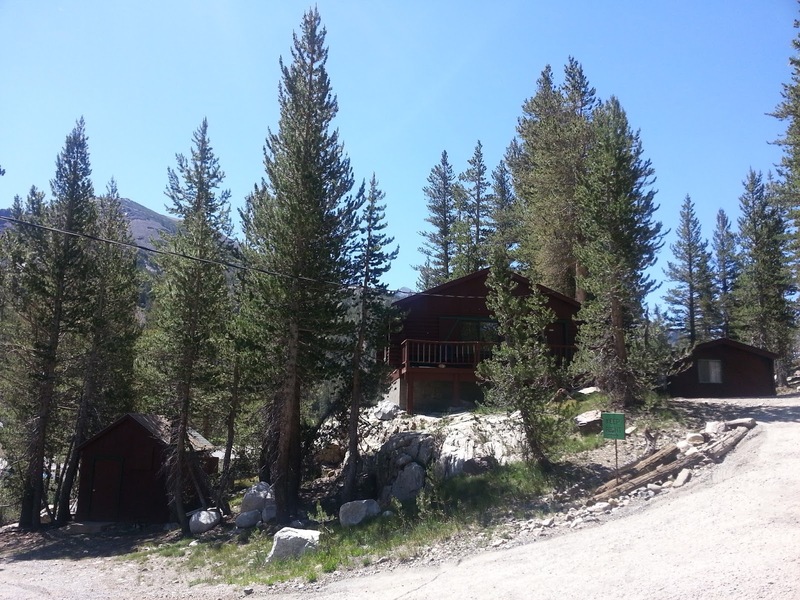 We stayed in cabin 9 which is in a secluded location closer to the hills with a water creek flowing nearby. It had a wooden bench in its backyard where we enjoyed our morning breakfasts listening to the chirping birds and the flowing creek. To get the best view of the location, all you have to do is to take a small hike from behind the cabin which takes you to the top of a hill from where you can enjoy the beauty of the surroundings. That is exactly what I did on the evening we arrived and what an amazing experience it was. The sun has set and the birds were retreating to their nests. It was calm and cool. There was freshness in the air and orange hues in the sky from the sunset. I could see majestic granite rocks on one side, tall green trees on the other side and huge meadows dotted with water ponds between hills and valleys. It was a sight to behold! As I stood there alone, trying to take in the beauty of the moment, I closed my eyes and I felt peace. Inside and Out. With myself and the Surroundings. In that moment of silence, I experienced the beauty of stillness and the pure joy of living. And traveling. Before we reached the cabin on day 1, we did quite a few things. We entered the Park through the South Entrance and our first stop was at 'Mariposa Grove of Big Trees' which has Giant Sequoias as much as 300 feet tall and two centuries old. We did the 0.8 mile hike to see the massive, 209-foot-tall Grizzly Giant. The tree is huge and is 2000 years old. It has been through a lot and survived many forest fires. Respect. Okay, I know you can't see the top - Trust me, it is huge and we tried!! Bidding goodbye to the giant Sequoias, we continued on our drive to the Tioga Pass. We stopped at Tenaya Lake which is Yosemite’s biggest lake. It was so picturesque and so inviting that we decided to jump straight into it, ignoring the cold waters and the fact that we still have a good half-hour's drive to reach our cabin. The water was so fresh and so clean that we took several dips before we came out and felt so rejuvenated that it is difficult to explain. Make a mental note: A dip in the Tenaya Lake is a must, when you go to Yosemite. Yosemite has many beautiful lakes dotting the meadows, but this lake will always remain special to us. After the refreshing dips, we continued our drive on the Tioga Pass, passing by the Tuolumne Meadows. Those vast lush green meadows were so romantic that we decided they deserve the attention of another day. And, we continued on our drive and reached our cabin which is about a mile outside the East Entrance of the Park. It was a long drive from the South Entrance to the East, but if you ask me, Tioga Pass is the most beautiful part of Yosemite and you should drive through it at least once during your trip. We did it on both days and enjoyed the scenic drive. The next day, we decided to explore the Yosemite Valley. There are many must-see viewpoints to admire the Valley from, but we decided to head straight to the Glacier Point. One can sit for hours here, looking at the majestic half dome, the scenic waterfalls and the Valley itself. After spending an hour, we headed to the Sentinel Dome. 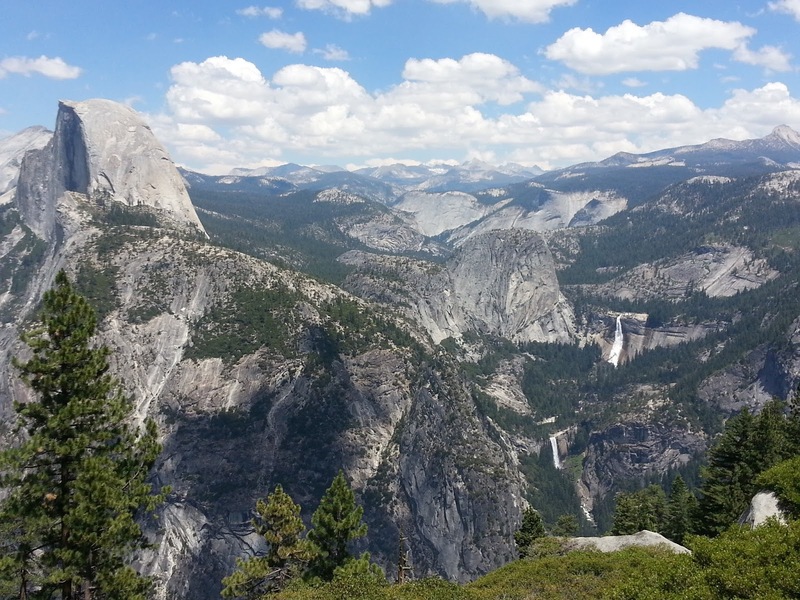 Reaching the top of Sentinel Dome takes a hike of only 1.2 miles with an elevation gain of 450 feet. We quickly reached the top to get sweeping views of the Valley, El Captain, the Half Dome and the waterfalls. It provides a 360 degree view of the Valley and the Domes. After a quick lunch, we headed back to the Tioga Pass. We stopped in between to do a couple of not-so-quick detours at suspecting places hoping to find a bear. We found none. The search itself was interesting though. We called it a day and reached our cabin to cook food and have drinks. The next morning, we went back to Tuolumne Meadows and spent a half day strolling in the grass, crossing the water creeks, sitting on the rocks - Just relaxing. At noon, we decided to proceed to LA taking the U.S. route 395 for about 350 miles, supposedly a very scenic route. After driving for about 15 miles, we stopped at Mono lake, a very picturesque 70 square-mile shimmering blue water lake, to take a few pictures and have a quick lunch. A quick glance at the brochure that we nonchalantly picked on our way out revealed that the lake is 760,000 years old and is hyper saline. And that swimming would be a good experience and now hold your breath - 'you could actually float on the waters'! What? Really? In California? I thought it was only possible in Dead Sea. Now, we have to try that. Ain't it? We found a secluded spot with the help of a volunteer and decided to try it out for ourselves. No kidding, I did float!! I was so excited and shouted like a kid. After spending some more time in the lake, when we came out, there were salt deposits on our bodies making us look like ghosts. We had to wait for a few more hours before we could rinse some of it off. What was supposed to be a quick stop ended up being a 4 hour experience. If you ask me, it all felt like a natural, outdoor, completely free spa experience :) I have to mention that we found some pumice stones in the lake and brought them home. Taking several detours, we only managed to travel about 50 miles on the scenic 395 before it started getting dark. So, the rest of the scenery on the route would have to wait for another trip. All in all, an interesting and fun trip it was to Yosemite National Park and beyond! Note: Don't miss your 'free spa and float' experience at Mono Lake on your next visit to Yosemite National Park.